This tour is a gastronomic journey through the hidden alleys of Old Town. We present Czech cuisine and its meaning in a daily life through tasting the food and drinks of the highest quality. 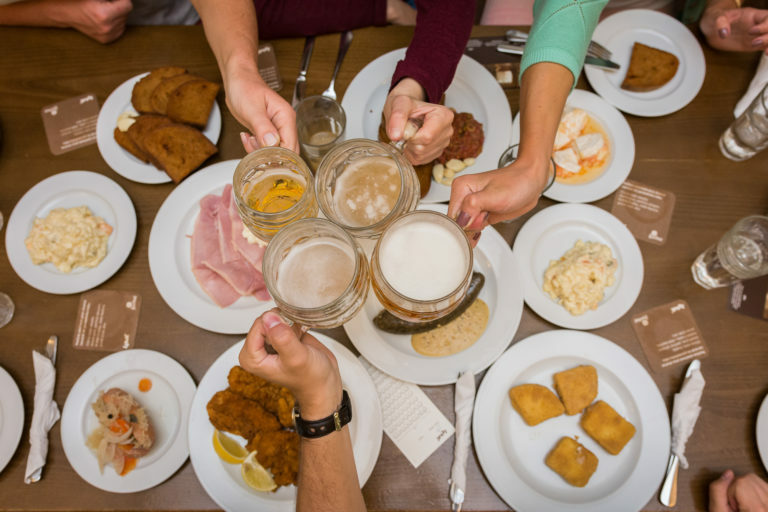 We make your evening or afternoon a memorable experience full of tasting Czech food and drinks at independent locally owned spots(food, beer, wine, spirits, non-alcoholic drinks, our tips on foodie spots and our own map-guides are included in the price). Let us share with you our passion for great food, join us on this tour and experience Prague in a different way! 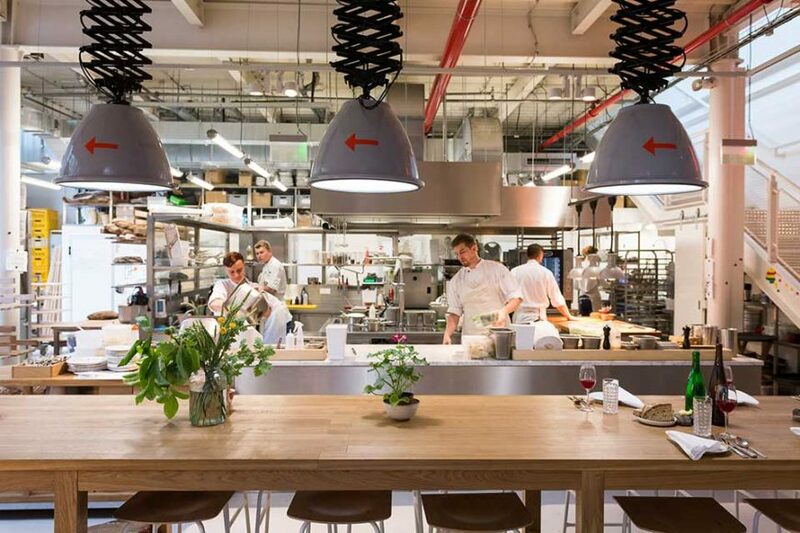 This tour is a journey into the hippest gastronomic neighborhood of Prague which stays hidden from the eyes of travellers. 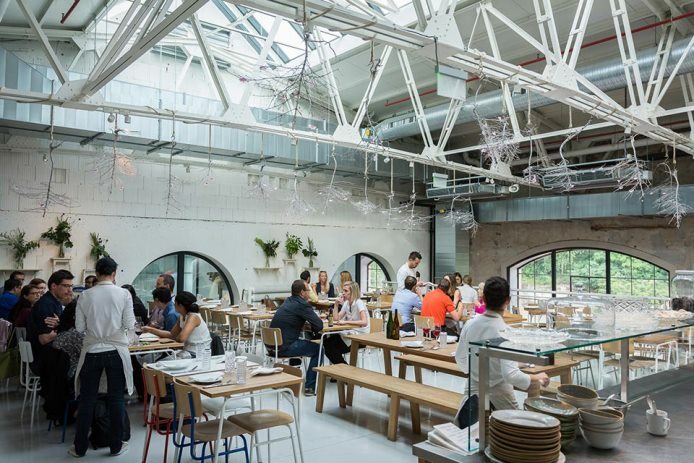 During this tour we visit foodie spots and the hottest venues in town where we present Czech cuisine from fine dining to pub food. 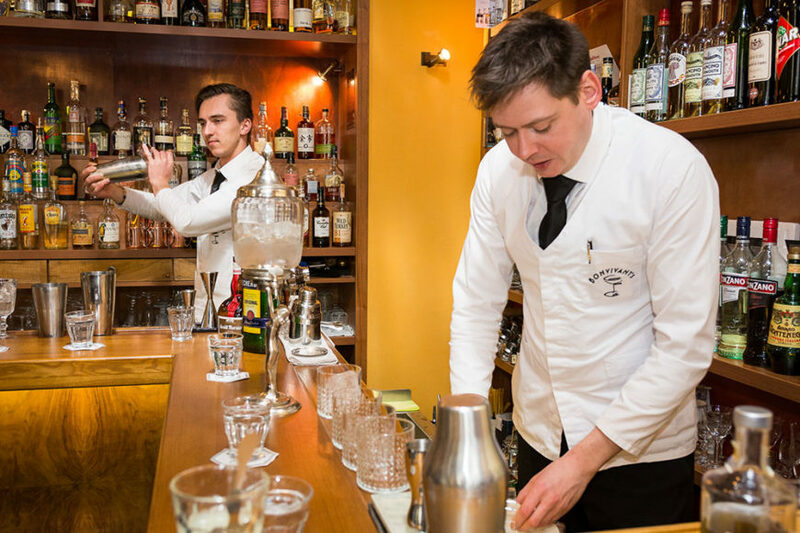 We get to know Czech pastry, our beer related dishes and farm-to-table food prepared using forgotten cooking local traditions, Czech alcoholic drinks are a must too. 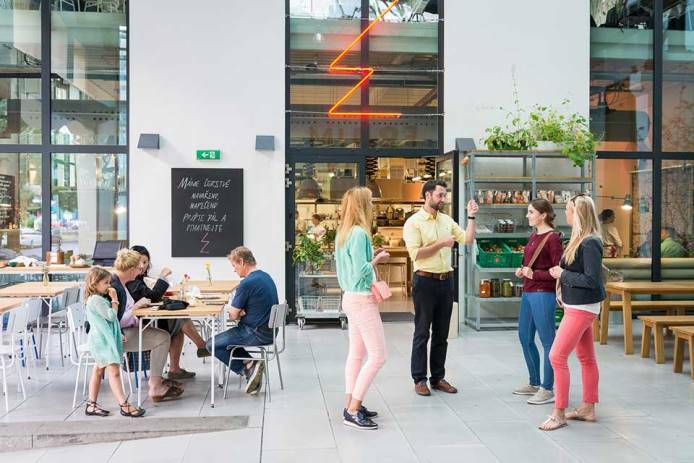 If you like the idea of being locavore, blend in with locals on this lunch tour which ends in the city centre! 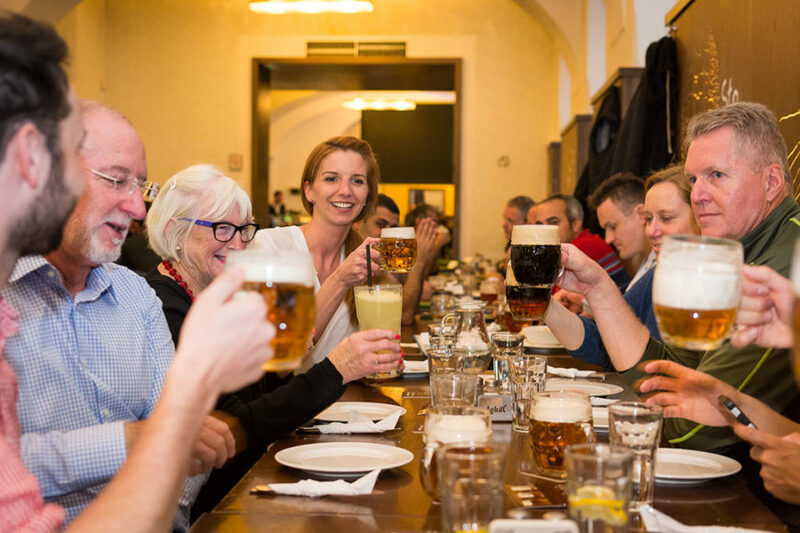 This tour is a must for beer lovers and enthusiasts to learn about the history of Czech beer, Czech brewing styles, and sample an excellent selection of beers from one of the best beer producing countries in the world. You will visit 4 different and unique breweries, learn about how beer is made today, and how it used to be produced centuries ago. 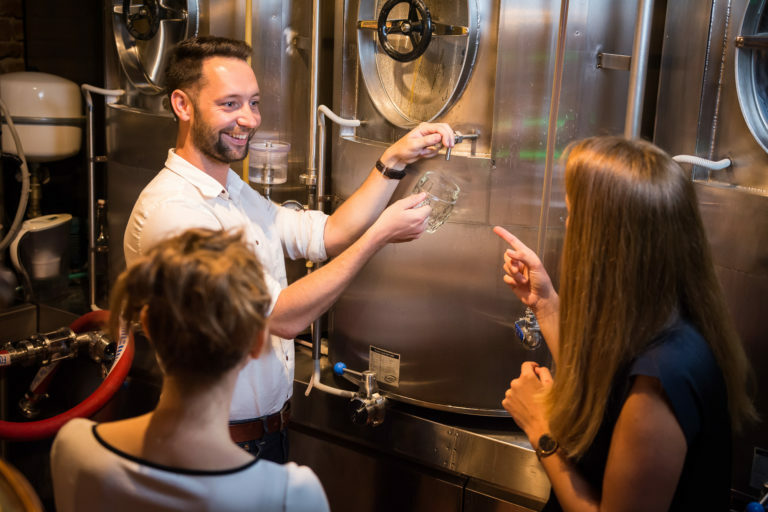 Taste local brewing ingredients, observe the brewing process and learn the four different ways that Czechs draft their beer, whilst even giving it a go from behind the tap yourself. We bring together the joy of savoring hand-crafted beers and culture; whilst sipping your beer you will learn about the history of the Czech Republic in Leona and George´s accelerated, but very interesting, history lesson. Savor beer still smelling of yeast, hops, and grains from breweries dating back 600 years. Discover our local every day celebrations, and finish your tour happy, satisfied and enlightened! 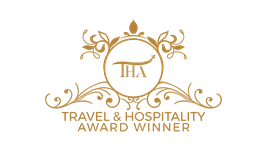 We want our guests to experience authentic food that represents our culture at independent, locally owned memorable spots where food is thoroughly prepared and beverages are served with love. We want to show you that we love to eat more than just dumplings. On our tours we take the guests to our own personal favourite places with the best quality of food and the hot spots with a special atmosphere. Along the way we take you for a walk off the beaten track, through tiny streets and secluded places. As your local guides we will definitely give you a lot of tips on the best hidden foodie highlights so you can enjoy your Prague food experience also after the tour. We are George and Leona, food and travel enthusiasts, who strongly believe that food is one of the best and easiest ways to connect with a new culture. 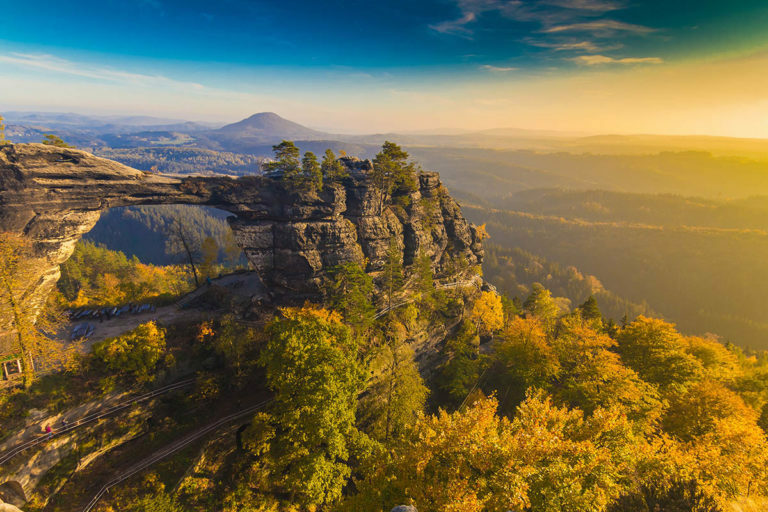 Locally from Prague, we welcome our guests for small, authentic tours allowing you to taste the best quality Czech cuisine, learn a bit about our history and explore and connect with the Czech culture. 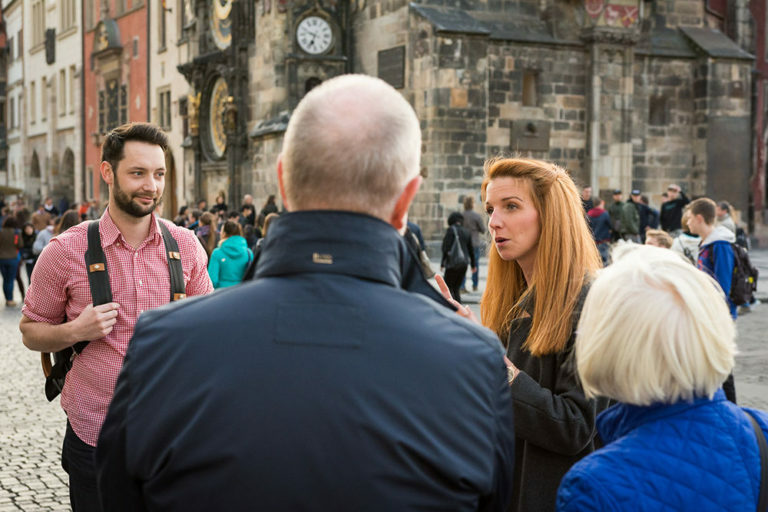 We began Prague Food Tours in 2014 and continue to guide our guests in person around the places we like with love and passion. Our Delicious Food Tour and our Beer Indulgence Tour take place in the heart of Prague Old Town. The Delicious Food Tour walk among the places which represent the best of Czech cuisine is about 4 km/2.5 miles long. The Beer Indulgence Tour walk among the breweries which represent the best of Czech beer culture is about 2 km/1.3 miles long. We pace the food and drink servings so you can enjoy the walk, admire the city´s beauties and eat at the same time. Our Scrumptious Food Tour takes place out of the busy city centre. The walk is about 2.5 km/1.8 miles long. Our aim is to show you also different facet of Prague and get you to the places where people live and love to eat. The Delicious Food Tour starts at either 11.30 AM, 12.15 PM and 5 PM or 6 PM and takes 4 – 5 hours. The Scrumptious Food Tour starts at 11.30 AM and takes approximately 3.5 hours. The Beer Indulgence Tour starts at 11.30 AM and takes approximately 3.5 hours. On request we will be happy to adjust the starting time to your needs and wishes. If you are delayed, please let us know. We will be waiting at the meeting point for max. 10 minutes, after that you can join us on the way. Everything from the food, alcoholic and non-alcoholic beverages, our suggestions for Prague itineraries to our map with foodie spots to visit. 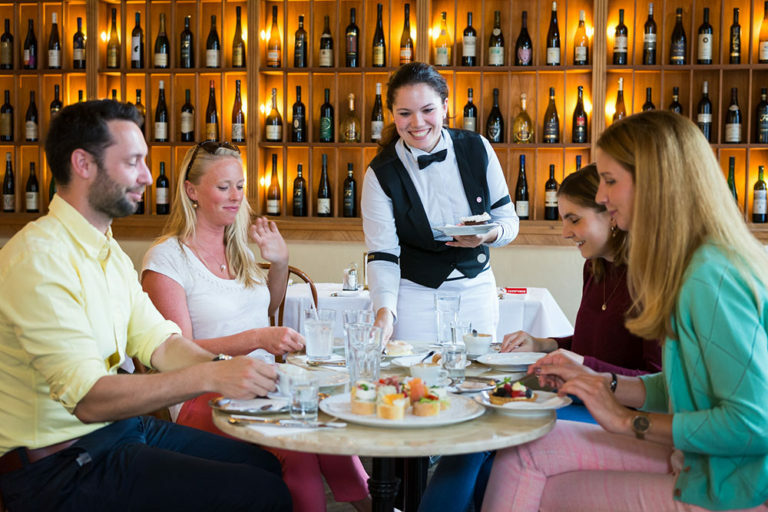 What is the difference between the food tours? Both tours present Czech cuisine, each one is held in a different part of town. Scrumptious Food Tour is held in a calmer residential area whilst the Delicious Food Tour is held in the Old Town of Prague. 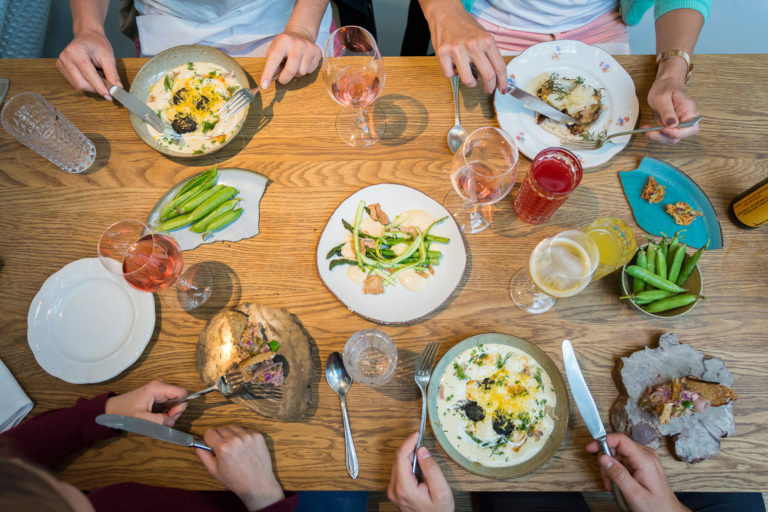 The Scrumptious Food Tour explores the newest restaurants and trendy foodie spots in town whilst the Delicious Food Tour takes the guests to the old local favourites. Both tours are food and culture oriented. A lot! We recommend to skip the main meal before the tour starts. Can vegetarians do the tours? Of course, everybody is welcome. We will customize the tour for you. What languages do we run the tours in? All you need is an internet access and your credit card. After receiving your inquiry we offer availability we have during the requested period. If one of the dates offered is suitable, we send out all the info about the tour and a confirmation after receiving the deposit. Please start with filling out the form below. We will fully refund your deposit in case you cancel at least two weeks before the scheduled tour. If our group is larger than 9 persons, can we do the tour? Of course, we will arrange a special tour for you. If you feel like joining us on one of our tours, please provide us with the following information.